Not all Hamas terror chiefs think that the terror group "won" Operation Protective Edge. Hamas is split over the cease-fire with Israel, a report in Israel Hayom said Thursday. According to the report, Hamas chief Khaled Mashaal, who lives in Qatar and is close to the heads of the government there, is sorely disappointed with the deal, and considers it a “Hamas failure,” the report said. 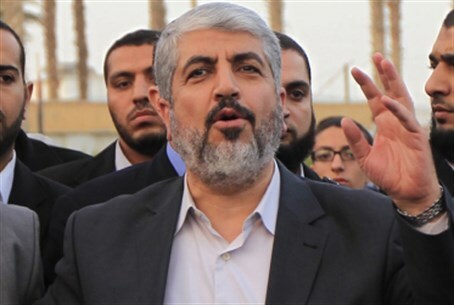 Mashaal and those in his faction inside Gaza have not reacted publicly to the announcement of the cease-fire, and did not participate in the demonstrations celebrating Hamas' “victory” in Gaza Wednesday. During those demonstrations, Hamas Gaza leader Ismail Haniyeh proclaimed the victory, claiming that Hamas had only agreed to the cease-fire after “inflicting a defeat” on Israel. Mashaal threatened on Sunday that his group will not only continue attacking Israel from Gaza, but will also launch attacks from Judea and Samaria as well. In an interview with Iranian media, Mashaal claimed that Gaza has been under attack for fifty days but was able to disrupt the plans of the "Zionists". Many in Israel are also critical of the deal. The celebratory mood in Gaza is juxtaposed with growing criticism in Israel against Prime Minister Binyamin Netanyahu, who is perceived as having not taken enough decisive action against Hamas in the seven week campaign to make the terror group submit, instead agreeing to numerous ceasefires that have been quickly breached. A Channel 2 survey on Monday showed that in just four days Netanyahu's approval rating dropped from 55% to 38%; at the time of the ground entry to Gaza earlier in the operation, that rating was as high as 82%.